Posted on April 7th, 2009 , under News. 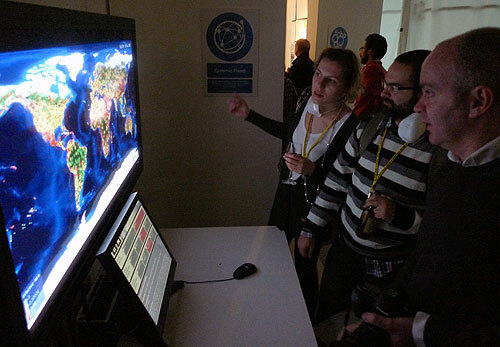 Epidemic Planet – Explore how high-speed travel whisks new strains of influenza around the globe and how effective measures to prevent pandemic may pose daunting ethical and political challenges. 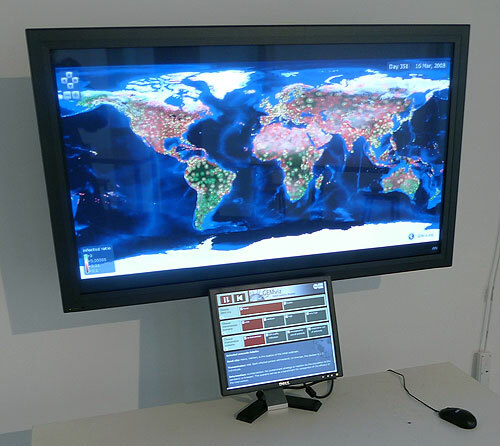 A large screen coupled with a touch-screen interface will allow the visitors to explore several possible scenarios of propagation of the pandemic influenza in the world, according to: different seeding initial conditions (e.g. Hanoi, Vietnam vs. Dublin, Ireland); milder or stronger virulence of the pathogen indicated by the reproductive number (i.e. the average number of infections that an infectious individual can generate in a susceptible population); a series of intervention strategies based on available drugs or on travel restrictions aimed at mitigating the impact of the pandemic and delaying its spread at the worldwide scale. Opening with a three day long festival of events, talks and performances INFECTIOUS will start spreading on April 17th and will hopefully be contained by July 17th.